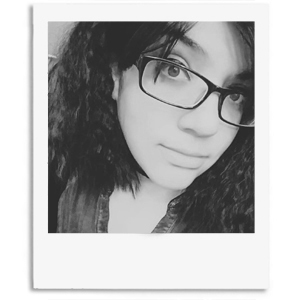 Hi everyone, how's it going today? I'm super excited today, because I finally get to let you in on a little something. I was recently contacted by Live Love Polish to review a polish of my choice from the Seche line. Say what in the who now? Seche has polishes?! That was my first thought at least, haha. But we shall not miss out any longer ladies, because Live Love Polish is carrying a bunch of their newly released polishes. I think typically the vast majority of us think of one thing when someone mentions Seche. That would be Seche Vite, the widely known and loved fast-drying top coat. Now if you haven't heard up to this point, Live Love Polish is a brand new online retailer that carries some of my personal favorites. Along with Seche, you'll find brands like China Glaze, Color Club, and Floss Gloss just to name a few. Not to mention, the site offers free shipping in the US on orders of $20 and up. 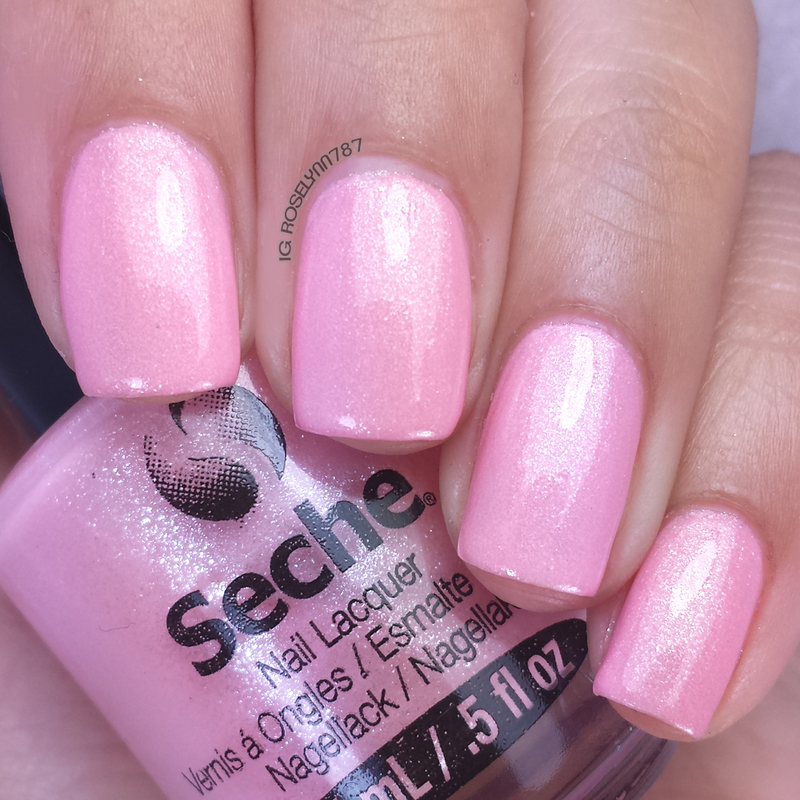 Debutant by Seche is a gorgeous light pink shimmer polish. As soon as I saw this polish on my nails, I fell into a deep state of love. Little heart-shaped eyes, romantic music in the background, all the works. I don't own a lot of pink polishes in my collection, because it's so hard to find ones that don't clash against my complexion. I'm going to risk sounding vain, but doesn't this look stunning on me? As for the formula, it was pleasantly surprising to say the very least. Again, normally I tend to shy away from shimmers but this one was calling my name. Formula applied very evenly with each layer and only took two coats for a fully opaque finish. Along with Debutant, I had also received a bottle of the fast-drying topcoat that we all know about, Seche Vite! 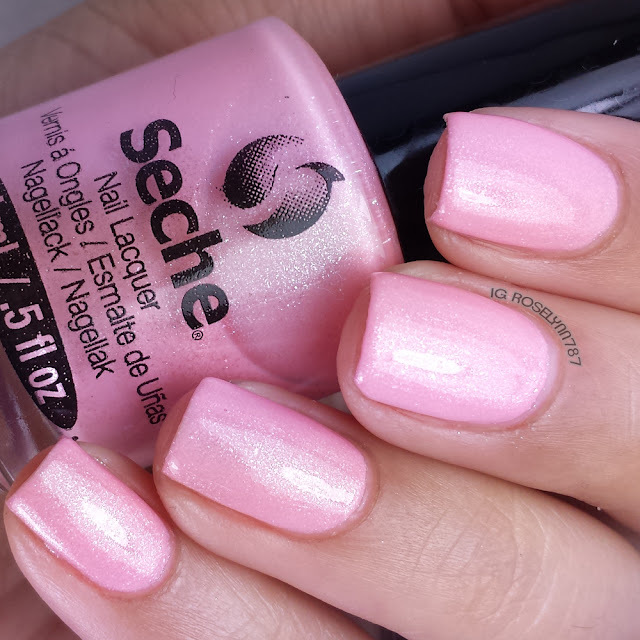 Back when I first started in the nail community, Seche Vite was one of the first top coats I ever tried. Like with all products, it has its pros and cons. Briefly speaking, the biggest set back is the shrinkage that may occur. In my experience, shrinkage doesn't occur every single time but for someone who polishes as much as I do, it becomes noticeable. Now, of course, the biggest 'pro' of them all is the fastness in which it dries. Just yesterday, I had to do a mani in under thirty minutes because I was rushing to work. I managed to do some stamping over a gradient and immediately seal it with Seche Vite. Before I had time to think, it was dry and I was out the door. Not to mention, there was no smearing to the stamp. This alone makes me want to give Seche another shot in the top coat department. For the next few weeks, I'll be using Seche Vite in all of my manis and fill you guys in on my thoughts as I go. Don't forget guys, you can now purchase all your Seche needs at Live Love Polish. And be sure to give their Instagram page some love and a follow @live.love.polish. Have you guys tried any Seche polishes before? Which one do you guys recommend I grab next time? I haven't tried any of their nail polish yet but I'm glad to know it that it also dries quickly! That can be such a relief at the end of a long day when I do my nails. Exactly! There is nothing worse than doing a mani, then falling asleep, and waking up to polish smudge across your face lol. Happens to me way to often. It DOES look stunning on you! I am struggling to subdue my exaggerated covet response! Haha thank you so much! I felt so vain just staring at my nails with this polish on. Yes, it is and it definitely made me feel like a princess with it on lol. You definitely should! I'm sure it's going to look even more stunning on you. Yeah, I don't think the masses know about their polish line. The cremes especially are so good for marbling and stamping. Wow I've never heard of this eretailer before! I'll have to go check them out! Especially for the free shipping!!! Right?! It always kills me when I have to pay a lot on shipping cause I think it could be another polish with that money. Yeah I'm looking forward to trying out their topcoat with all different kinds of manis. I need to finally have a steady one to use. Just give in to the calling!! lol. Seriously you won't be disappointed with this polish and it's like the perfect pink for Valentine's Day. I've only ever tried their topcoat, but that pink is absolutely gorgeous!!!! I may just have to try their lacquer now! Oh my -- that shimmer!! This color looks so wonderful on you!